Forget your plastics. There is a naturally occurring material with better properties. 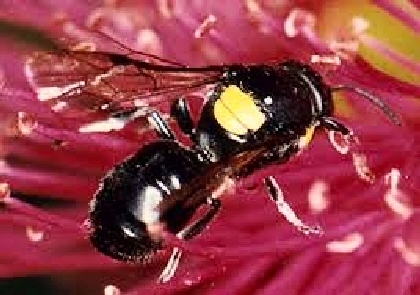 It is produced in the nests of the Australian masked bee. The substance is resistant to fire and repels water. Furthermore, it is very strong. A company called the Humble Bee located on New Zealand is reverse-engineering the cellophane-like material in an attempt to create a biodegradable substitute for plastic. If successful, world pollution will be substantially reduced. We are so dependent on things made from oil. The little bees sourced from Noosa in Queensland hold out great hope for a reduction in such products. A way of trapping the Hylaeus nubilosus has been developed by Chris Fuller of Kin Kin. Veronica Harwood-Stevenson has spent her house deposit and winnings from the Wellington Regional Economic Development Agency's Bright Ideas Challenge on the project. It is in the early stages. Ways of manufacturing are being studied. The aim is to initially make outdoor apparel and gear from the avian compound. Though the company has a green outlook, it has to make a profit in order to survive in such a competitive industry. Success would mean landslide profits.